it can be a cheap or expensive as you want. You can make a simple enelope or a package!! Yey i was waiting for this one! I think its a great idea! Cant wait to get started, how long will the sign up time be? hmmm lets wait till next friday as see how many we get. Woot!! Way to get the ball rollin ladies! 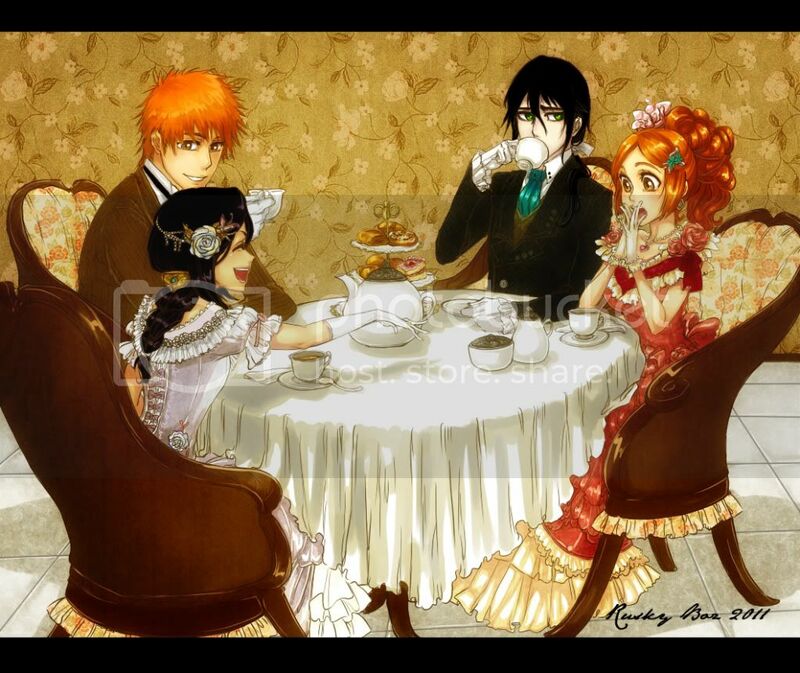 hahaha Bleach Tea Party!! Thats a funny pic. YAY I have been waiting for this one! I could make lovely things from this! This looks like a lovely swap! I would like to join but can't send out till the beginning of next month... Is that okay? Unluckily for this one I won't be able to be paired up with anybody in the US - Italian posts won't allow you to send anything "edible" to the States (I've learnt it to my cost). Not sure if tea falls into that category, but I wouldn't like to risk it, as they're not telling you in advance - the package just disappears along the way. I guess they're being incinerated at the US douane or something like that. SO! I guess is someone in the UK or around there for me, then. Selina G., what do you think? I love your style, I've been thinking about doing a swap with you for a long time - want to give it a try? Michelle - my newbie swap isn't "complete" yet because I'm sending out the package tomorrow and my vet is in the US, so it's going to take a week or so for the package to reach her. Could I take part in this anyway? Pliz?